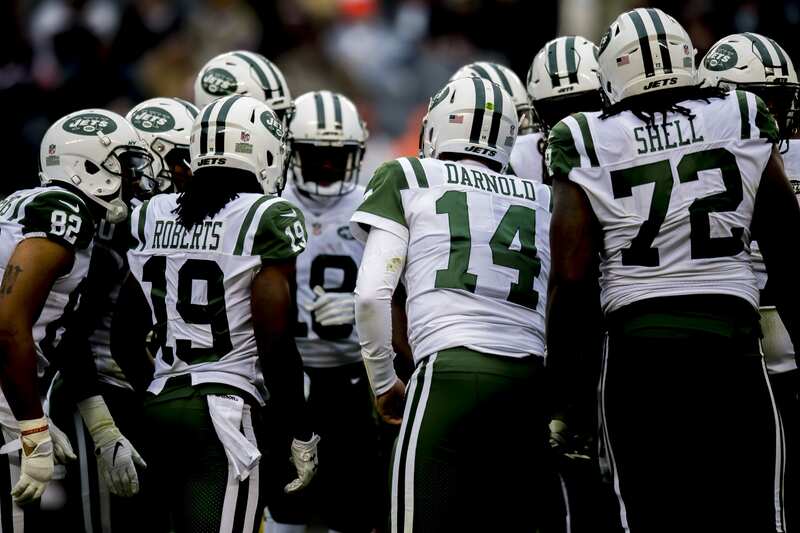 Home New York Jets New York Jets: What Pass Catchers Should They Pursue This Offseason? New York Jets: What Pass Catchers Should They Pursue This Offseason? For the first time in a decade, the New York Jets are not looking for a quarterback in the NFL draft or free agency, as Sam Darnold has solidified the role of the franchise quarterback for the organization. Objectively speaking that is a relief for any team, but for the Jets to have Darnold fall to them last year after trading away three 2nd round picks and entering the offseason with a plethora of cap space, is a dream come true for the franchise. With confidence surrounding the most important position in the sport, the next logical step would be to capitalize on the asset by acquiring weapons for the quarterback. Unfortunately, that is much easier said than done, even with the estimated $100 million in cap space New York will have this offseason. Often a minor detail is skipped whenever the Jets 2019 cap space is mentioned… the Jets only have one-third of the team signed. The NY Jets front office have their work cut out for them entering the season with one wide receiver and one tight end with significant receptions on the roster and no starting Center, Left Guard, and the starting Right Tackle ended the season on the injured reserve. One undeniable need for Sam and the Jets, are pass catchers. What better time to examine the pass-catching market than these days, where trade rumors of all-pros Antonio Brown, A.J. Green, Odell Beckham are flying all over the place. If you think the national media is bad with the rumors, I dare you to take a gander into #NFLTwitter in the offseason and check out the awful trade takes. With fallacies running amuck, examining the numbers and consequences are important. In order to analyze the direction of the franchise (without direct contact with the front office), the key is to examine the best possible financial and on-field outcome from the transactions. For the sake of Jets nation, let’s first grasp the NY Jets current pass-catching personnel for 2019. There are only 4 guaranteed contracts… so this shouldn’t take long. Quincy Enunwa- Despite injuries, the Jets showed that Quincy, who thrives in the slot and is a sure hand for Darnold, was their top priority. Enunwa agreed to a 3-year extension for $16 million guaranteed and about $23.8 million if he remains with the team until past the 2021 season. In English, Q has a 2 year $16 million contract and the Jets have the option for a 3rd year that would bring the contract total to about $24 million. That is a nice bargain for the Jets and a nice haul for Quincy, a versatile player who has unfortunately been unable to remain consistently healthy. Charone Peake is the only other wide receiver with any guaranteed money on the roster, and he specializes in special teams- pun intended. Although you can always find Peake around the ball during kicks and punts, the odds are he will be fighting for a spot in 2019. Releasing or trading Peake at any time this offseason will only cost about $17,000 of dead cap and save $720,000. Chris Herndon, the rookie and phenom tight end 3rd round pick from the Miami Hurricanes has impressed the Jets and the notion is the young tight end will excel in Gase’s system. The only other tight end on the roster is Jordan Leggett, a 2017 5th round draft pick from Clemson, who has battled some injuries and will probably be fighting for a roster spot, depending on how the tight end room fills out. Robby Anderson is a restricted free agent, meaning the player has exactly three accrued seasons and his free agency is controlled by his team. I expect the Jets to put a 2nd round tender on the receiver and sign him to a short-term and low guaranteed, yet highly incentivized deal. A second-round tender allows the player to negotiate with other teams, but the original team has the right to match any deal and will receive a second-round selection as compensation if the team declines to match the contract and allows the player to sign with the other team. This will be a huge prove-it year for Robby because the young wide receiver needs to protect the ball better, work on his rapport with Darnold which seemed to be clicking toward the end of the season, and stay out of trouble in the offseason. Andre Roberts is an Unrestricted Free Agent, meaning the player is on the open market. I look for retained Special Teams Coordinator Boyer and GM Mike Maccagnan to resign the dynamic return specialist who became the first Jets Special Teamer return specialist to make the Pro-Bowl. Neal Sterling, an unrestricted free agent tight end who mostly serves as a pass catcher, is an interesting player that I can see thriving in a two TE set, on a low guaranteed, yet a highly incentivized deal. Deontay Burnett, a wide receiver from USC who played with Darnold and has worked his way up in the ranks in the Jets organization, is an exclusive rights, free agent. An ERFA is a designation (usually reserved for undrafted free agents) for players with less than two seasons accrued in the NFL that does not allow the player to negotiate with any other team. This designation gives the team all the leverage in offering a contract and the player can either accept it or not play. I expect Burnett to be back with the team, brewing with confidence, and I look for the young receiver to continue to show strides of productivity. It is unethical to speak about the 2019 free agent wide receiver class without mentioning running back, yes running back, Le’Veon Bell. Bell, who infamously tweeted “Yup ima Jets fan…What can I say? I love #GreenAndWhite” in April of 2011, is widely believed to be on top of the Jets offseason wish list and for good reason. Bell’s stats as a pass catcher, running back, and pass protector are impeccable and not even worth talking about. However there are complications, beyond financial figures, that may hinder a Bell signing such as the Pittsburgh Steelers slapping Bell with the transition tag and trying to coerce a sign-and-trade. Another potential pass-catcher/running back to hit the market will be Tevin Coleman, the running back from Atlanta. With very little tread on his metaphorical tires due to sharing snaps with Devonta Freeman, Coleman is a very solid plan B for the franchise that would be a dynamic weapon in a Gase and Darnold offense. Also, Coleman would surely sign for cheaper and fulfill a similar role, as we all expect Lev Bell to set the new running back market. If and when, Bell or Coleman is signed, they will likely join Elijah McGuire and Trenton Cannon in the backfield. Unfortunately, Bilal Powell, beloved by the Jets fan base and organization alike, will likely not be returning next season after suffering a scary injury that put the veteran RB on season-ending injured reserve. Meanwhile, Isaiah Crowell would likely be relieved of his New York Jets duties for a $2 million dead cap hit and $3 million in cap savings. When it comes to the tight end room, I expect new head coach Adam Gase to be aggressive. Just last season, Gase who was in charge of personnel decisions, drafted two tight ends in the same draft. Yikes. Luckily Mikey Mack is the man making the transactions and therefore I look for NYJ to add low risk/high reward veterans with some injury history that will be good for the film room and team chemistry such as: Maxx Williams, Tyler Eifert, or maybe even bring in Austin Seferian-Jenkins for a reunion with the Jets. There is no doubt that the Jets are in the market for a WR1 and there are no players that that really fit that bill in the 2019 free agent class, starring: Devin Funchess, Tyrell Williams, Adam Humphries, and Golden Tate. If the Jets are going to sign an RB to a historic deal and resign Robby Anderson, it does not make much sense to overspend. Maccagnan has shown a willingness to pay top dollar for premium players but doesn’t engage in overspending with mediocre talent. Simply put, Mac shops at luxury stores and goes bargain hunting, nothing in between. With the WR market relatively dry, the Jets could explore the trade market to give their franchise quarterback his star #1 receiver. From the Pittsburgh Steelers perspective, Antonio Brown must be traded between March 13-17 (when the league starts and before roster bonuses kick in) or after June 1 (so the Steelers can spread the cap hit over the next 2 years, roughly $12 million in both 2019 and 2020). The Steelers are in a tricky position because they are trying to get value for a disgruntled superstar receiver who has publicly asked for a trade. To make matters more complicated, the player counts for $21 million on the cap even if traded, and Brown is probably looking for a new deal once acquired by a different franchise (which means Brown’s team has to basically agree on the destination of the trade). Not only will the AB distraction hover around the team all offseason, but more importantly the 2019 offseason cap space will still be held by AB’s contract. There is no doubting Brown is a top wide receiver in the league, however there is additional offseason baggage that is a red flag to the Jets front office, such as an alleged domestic dispute, which the NY Jets have already made clear this offseason (after being asked about domestic abuser Kareem Hunt) that a domestic violence charge was unforgivable for employment at 1 Jets Drive. Odell Beckham Jr. is another superstar wide receiver who remains disgruntled with his team, coaches, and quarterback. The interesting note here is that OBJ is under contract with the New York Giants, who share the same stadium and city as the Jets, and are not exactly known with being friendly with each other. With the Jets holding the current #3 pick, Darnold at QB, and the team’s willingness to trade down, combined with the Giants #6 pick and Dwayne Haskins the QB from Ohio State reportedly on their radar, there may have never been a more perfect time for the two franchises to put their differences aside and possibly make a win-win trade. In terms of salary cap implications, the Giants can trade OBJ before June 1st for a cap casualty of $16 million, or post-June 1st to save $17 million on the cap in 2019 and spread the dead cap $4 million in 2019 and $12 million in 2020 (Spotrac). The Jets can take the short-term cap hit and the risk for the franchise, in terms of long-term financial liability, would be minimal because there’s a potential out in 2021 with an $8$ million cap hit… we’ll cross that bridge if that time ever comes. A.J. Green, the all-pro wide receiver from the Cincinnati Bengals, may be the most likely veteran wide receiver to be acquired by the Jets via trade this offseason. The Bengals have fired Marvin Lewis and the coaching staff this offseason and are looking to start fresh. One of their first items of business could be to shed the last year of Green’s contract, which would result in about a $12 million savings and $3 million in dead money (Spotrac). Instead of unceremoniously releasing the veteran wide receiver who has seen his fair share of injuries, the Bengals might be searching for a low round draft pick such as a (5th or 6th) to at least get some compensation back, notwithstanding a potential compensatory pick. A.J. Green fits the bill for Darnold as a sharp route runner outside of the hash marks, will provide veteran leadership to the wide receiver film room, and the bargain transaction fits the mold of New York’s front office. I imagine A.J. will be motivated to show the NFL he is healthy and eager to play well and earn a new contract after the season, it’s a perfect fit. Do not look for the Jets to draft a WR in the first round with their current #3 pick. In fact, even if the Jets trade down, I imagine Maccagnan spending the first round pick on essential needs for the team such as offensive lineman, pass rushers, linebackers, cornerbacks, and defensive linemen. At this moment in time, it is difficult to speculate what the Jets will do in the draft, due to the team filling needs in free agency. Nevertheless, here are some prospects that may be interesting in the mid-rounds to keep an eye on as the Scouting Combine approaches for Wide Receivers (on March 2) that project to play outside the numbers such as: Riley Ridley from Georgia, J.J Arcega-Whiteside from Stanford, Kelvin Harmon from NC State, N’Keal Harry from Arizona State (and coached by Herman Edwards), Terry McLaurin from Ohio State, and Gary Jennings from West Virginia, and Jaylen Smith from Louisville. Some gritty slot receivers to keep an eye on for the late rounds are: Terry Godwin from Georgia, Andy Isabella from UMass, Hunter Renfrow from Clemson, and Alex Wesley from Northern Colorado. Of course, as the chapter turns towards the new league year, new bonuses are set to vest, and therefore the market personnel is subject to change. However, on the offensive side of the ball I trust GM Mikey Mac (as I like to call him) to address the Center and Left Guard positions first, to lock up Bell or Coleman to fulfill the RB1/threat to catch out of backfield spot, lock up Robby Anderson for WR2, Andre Roberts for return specialist, and Deontay Burnett as a WR4/5. Now comes the hard part, the time to predict the transgressions, I mean transactions, of the New York Jets 2019 offseason. Of course, I’m kidding because in reality, for the first time since I can remember, I am very optimistic about how the Jets will attack the Offensive in the offseason, with salary cap and a franchise quarterback. In terms of pass catchers, I believe Mac will end up bringing in one or two tight ends on bargain deals with an injury history like, Maxx Williams or ASJ, as well as resigning Neal Sterling. I also expect the GM to kick the tires on free agents Devin Funchess, Tyrell Williams, and even Desean Jackson, but ultimately will make a trade for a Veteran WR with a low risk/high reward potential such as A.J. Green (or less likely, but with a higher risk/higher reward: Antonio Brown or Odell Beckham). I also expect Adam Gase to encourage Maccagnan to fill out the back end of the WR room with veterans that are familiar with his systems such as free agent Danny Amendola or to throw low risk/medium reward players in the mix such as: Kelvin Benjamin, Desean Jackson, J.J. Nelson, Breshard Perriman, or Jamison Crowder. There will also inevitably be some added depth via undrafted free agents and maybe a late round pick that gives a pass catcher or two the opportunity to show off their skills, and a chance to produce some chemistry with the playbook, Gase, and Darnold.